Halloween is only a couple weeks away! Halloween is only a couple weeks away, which means that it’s the perfect time to start decorating your home for the spookiest holiday of the year. 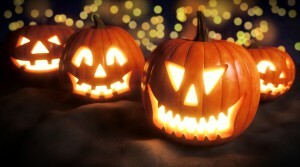 When it comes to home decorations, the best Halloween themed décor begins with your fence. As an owner of an aluminum fence, you’re already at an advantage. Black painted, iron, and aluminum fences serve as the best backbone for your haunted home. The aluminum fence is the perfect backdrop for your haunted cemetery. First, you’ll need to purchase gravestones and skeletons. If you want to DIY, making your own gravestone would be simple. All you need are a few pieces of plywood, and gray and black paint. Set up your ghoulish scenario in the yard, and then complete the effect with cobwebs laced over the fence. If you’re looking for a more traditional way to decorate your aluminum fence, try placing small pumpkins on the top of each, or every other post. You can use real or fake pumpkins. The splash of orange will be a tasteful way to show your spirit for the holiday without much preparation. This is a fun and scary way to decorate your fence. Purchase or DIY several signs such as “beware” or “keep out” and fasten them to the border of your fence. Finish it off by wrapping the fence in caution tape. This is another quick and easy way to show off your Halloween spirit. Power Fence Supply has years of experience in providing DIY-ers like you with the materials and knowledge needed to properly install aluminum fencing. We take the guesswork out of the equation and make it possible for you to have the supplies for a brand new aluminum fence delivered right to your doorstep. Whether you have installed fencing before or are looking to try your hand at it for the first time, we are happy to help you along the way. Visit us online or give us a call at (855) 469-5421 to get advice on your project or get assistance placing your order. For more useful tips and information about us, be sure to follow us on Facebook, Twitter, Pinterest, and YouTube.